A mother whose daughters have "life-threatening" food allergies took a discrimination case against a hospital after one had an allergic reaction. Maire-Iosa McVicker took her case after her children were twice exposed to food in an allergy clinic's waiting room. The waiting room in the Ulster Hospital originally had signs banning food and drink because of the risk to patients. The South Eastern Trust apologised after signs were removed and agreed to provide a specialised food-free room. The family was assisted in taking the disability discrimination case by the Equality Commission for Northern Ireland. 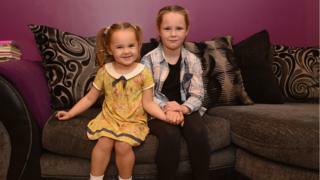 Seven-year-old Aoibhe O'Donnell and her three-year-old sister, Meabh, attend regular appointments at the Ulster Hospital's allergy clinic. The girls both suffer from food protein induced enterocolitis syndrome (FPIES). The condition can result in "severe physical reactions leading to physiological shock when they come into contact with certain trigger foods," according to the commission. When the signs banning food and drink from the clinic's waiting room were removed, the family said they encountered two occasions where people were eating and drinking in the restricted area. On the first occasion, Aoibhe experienced an allergic reaction and the second time Ms McVicker removed her daughters from the room to keep them safe. "I came to the Equality Commission because I was worried sick about the exposure of my girls to what could be a life-threatening allergic reaction," she said. "I felt that the trust, by allowing people to eat in the waiting room, had failed to make a reasonable adjustment which would help safeguard my daughters' health," said Ms McVicker. After settling her case, she said it was a "great relief" that the trust had come up with a solution to the problem. It has agreed to provide a separate parents' room which will be supervised at all times by a member of staff who will monitor the food and drink ban. The walls will be constructed of "fire glazing glass" and entry to the room will only be possible by swiping an electronic pass belonging to authorised staff. It will have clear signage informing the public of the ban and the room will be regularly cleaned with feedback from infection control. The work will begin next year as part of a wider refurbishment of the hospital's paediatric outpatients department. Until construction is complete, the trust will provide an interim waiting room where the food ban is monitored. Ms McVicker said the measures "will be of huge benefit to my children and to any others with similar conditions". The South Eastern Health apologised for "any upset and distress experienced" and settled the case without any admission of liability. Its director of hospital services, Seamus McGoran, said: "We recognise the challenges faced by children and parents living with complex allergies and are delighted that we have been able to find a solution for Aoibhe, Meabh and others when they attend for appointments." Anne McKernan from the Equality Commission, said: "This is a good example where, by using the opportunity provided by a refurbishment already scheduled, a reasonable adjustment has been made which will be of great benefit to the O'Donnell family and others in their position. "Every organisation providing services to the public, whether public or private, has a duty to make reasonable adjustments to make it easier for people with disabilities to use their services. "In this case the settlement involves no monetary compensation - but it does contain undertakings to provide a safe place for two little girls with a rare and serious condition."